Beyond the alleyways, cobbles and hustle and bustle of the ancient village of Lindos is a sanctuary of utter calm and bliss. Hidden in plain view and nestled on the sloping hillside of the world-famous Acropolis is Lindos Vigli. 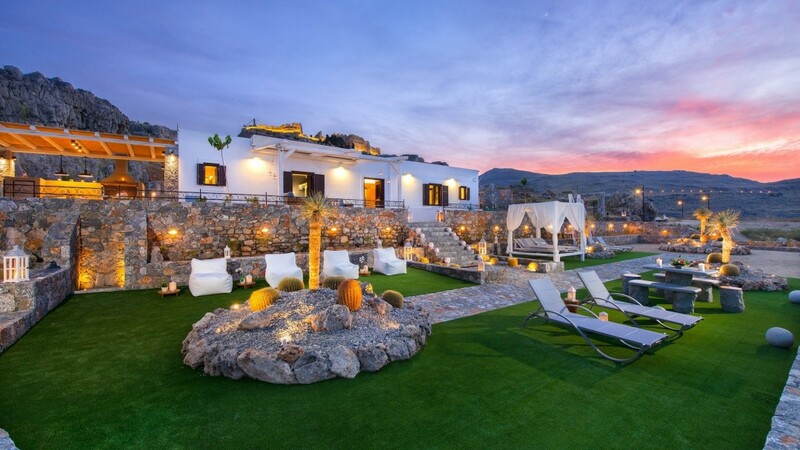 The Lindos Vigli private villa is the epitome of discretion and the height of elegance. Set in its own private gardens with a tiered terrace and courtyard, the seclusion of Vigli is unquestionable. Offering panoramic views of Lindos Harbour and the stunning surroundings of Lindos and the Acropolis, it would be easy to forget that you were just a few minutes’ walk from the heart of one of the most sought-after holiday locations in Rhodes, Greece. Featuring a unique fusion of traditional and contemporary living, Vigli can accommodate four guests in two exquisite double bedrooms, and is ideal for families, couples, friends and honeymooners. The generous courtyard and terrace offer a true and authentic outdoor lifestyle, with picturesque views as the perfect backdrop to your holiday. Comfortable modern furniture and a luxurious jacuzzi allows guests to experience extravagant outdoor living. Lindos Vigli has been restored with full consideration of the cultural and historical importance of its iconic location. Traditional building techniques have been employed and materials sourced locally to ensure that the property compliments its exclusive surroundings and blends in harmoniously. We would like to welcome you to our oasis of tranquillity and luxury…..welcome to Lindos Vigli. © 2019 Lindos Vigli Villa. All Rights Reserved.